Relatively rich on the palate but very flavorful and entirely seamless. ripe pear, honey and limey citrus and herbal notes. This bottling is intensely flavoured; ripe pear, honey and limey citrus come to mind. There are herbal/floral notes too - spearmint and lime leaf. As with all of our 2015’s, the natural acid is a treat. This is a wine crafted to express terroir by focussing on heritage grape varieties from the across the Cape wine map. 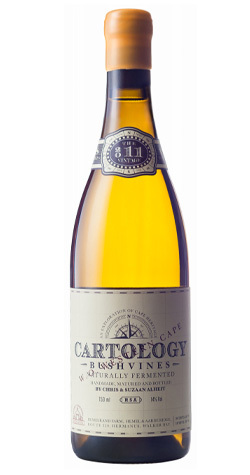 The Cartology 2015 celebrates the Cape’s winemaking history and heritage by focusing on Chenin Blanc, vinified from different vineyards including Skurfberg, Paardeberg, Bot River and Stellenbosch, as well as old vine Semillon from Franschhoek. The vineyards are key to this finely honed blend and in 2015 it is a confident and masterly example of the quintessential Cape white blend. Chris & Suzaan Alheit are a husband and wife team. They have traveled and worked harvest together in California’s Napa Valley, Western Australia, St Emilion, the Clare Valley & the Mosel River. Their love for adventure overseas has led them to New Zealand, Languedoc, Rousillon, Provence, the Northern & Southern Rhone & the Cyclades in Greece. They have a tremendous amount of respect and admiration for the great wines of Europe, a place they consider to be the heartland of truly fine wine. They strive, in their winemaking, to apply lessons learnt in Europe to what they do in the Cape. Alheit is based on Hemelrand, a beautiful mountain farm situated high on the Hemel & Aarde Ridge in Walker Bay. This rugged piece of fynbos covered land belongs to Hans & Mary Anne Evenhuis. Complete with stone buildings, Hemelrand is planted to an olive grove, lavender fields and a very exciting young vineyard. The Alheit’s aim is to make wines that have a fine form and are not bulky. The result is finely crafted wines that have ample power, but no excess weight – something akin to a gymnast, rather than a sumo wrestle. The Alheit’s are absolute minimalist in their winemaking approach. Grapes are whole bunch pressed. No enzymes, sulphur or yeast are used. The grapes undergo natural fermentation in old barrels with absolutely no new oak used. The first sulphur is applied in winter. The wines are not racked and they stay on the lees for ten months. Filtration is used only if absolutely needed. The wine is held for seven months prior to release.